Wow, it's been over two months since I last blogged. But worry not, I haven't abandoned this blog just yet. I return a married woman and armed with not one, not two, but three new recipes. A bad blogger olive branch, if you will. I was feeling inspired by the sunshine and, in all fairness, couldn't face eating anything hot given the weather outside so made this wonderfully decadent salad as a Friday night treat for myself and a friend. A combination of Mediterranean and Middle Eastern flavours, it is perfect for the exotic temperatures we're currently experiencing. I'm currently also in the middle of something resembling a serious pomegranate seed obsession too, so they will invariably pop up in many recipes in the coming months. As per the instructions on the bag, prepare your pearl barley - mine required two short boils in shallow water, before gently simmering for an hour. While the barley is cooking, cut the cherry tomatoes into 6ths, peel and dice the cucumber and add the olives. Mix up your dressing and add to the tomatoes etc to marinade. When the barley is cooked, rinse and drain thoroughly then add to the marinating salad. Finally, cook the edamame beans for 5 minutes, blanch (I used the miniature ones that you get in Waitrose), and add to the marinating barley. 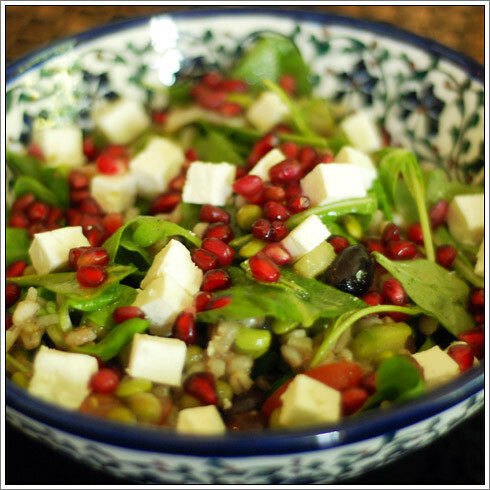 Add the rocket, lamb's lettuce and spinach and toss, then garnish with the diced feta and pomegranate seeds. Quick, easy and very delicious indeed!